Announcement Last day to order to receive by December 25th is no later than December 18th, thank you for your understanding! Everything is MADE TO ORDER - Processing time on all orders is 2-3 days unless otherwise noted in the listing, thanks for your patience! If you need your items by a specific time, please let me know ASAP and I will try to accommodate you. *A small deposit may be required before discussing custom designs. Last day to order to receive by December 25th is no later than December 18th, thank you for your understanding! The sticker was cool, but some letters stuck and some didn’t. I ended up taking all of it off. It looked nice on the paper though. 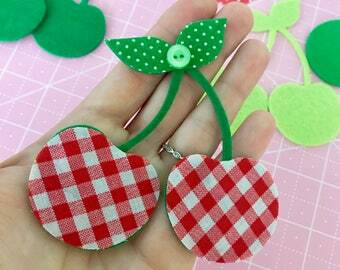 New cherry banner in the shop, order them with or without daisies! Cutest vintage camper inspired mini banner in the shop!! April Showers bring May Flowers! Snag these just in time for spring!! I started selling my wares from my dot com site in 2002 right after I got married, it was under a different name then and in 2005 I changed the name to Heyday Fashion, then to Heyday Dry Goods to better fit my wares. Heyday Dry Goods has evolved along the way as my tastes change. I usually make items to suit my needs or wants, and I am always excited when others like my stuff too! My favorite materials of choice right now is re-purposing vintage linens and fabrics or trims when I can find them! Hello, most of my friends know me as Neesy. I studied fine art and photography in college, and learned how to sew and crochet from my Mom as a girl. I live in NorCal with my husband and we have 3 amazing boys, ages 10, 8, and 5! Thanks for shopping at Heyday Dry Goods and thank you for buying handmade! All of our garlands, accessories, and designs are handmade and handcrafted by one designer; all the materials used are new or vintage pieces and noted in their description. All fabric items are sewed with a conventional sewing machine or with a serger sewing machine. Items are made with interfacing, canvas, cotton, or felt fabric to make them strong and durable. Since all Heyday Dry Goods design pieces are handmade, items may vary slightly, but will be pretty true to the sizes shown. If you have any other concerns or questions about our items, please contact us before ordering. If you are truly unhappy with your item(s) please contact us immediately. Our customer satisfaction comes first. If you wish to return an item and be refunded for any reason, you must send a request via email. Once we have reviewed the request and approved it, you must send the item back unused and in perfect condition in order to receive a refund. All items must be received within 7 days after the original ship date on your invoice. Sorry shipping costs will not be refunded. Please email for further instructions on returning an item. There may be a 15% restocking fee on all returned items. Custom made orders cannot be refunded. Heyday Dry Goods accepts PayPal or Credit Cards only as payment. US orders are shipped standard First Class Mail or Priority Mail with Delivery Confirmation. ~Made to order items will take about 3-4 weeks for processing time and will be noted in their description. ~Pre-made orders will be shipped out within 2-3 days, once payment is received. There will be an email sent once your order is ready to ship out. Please expect up to 6 weeks for all International order deliveries. Special shipping arrangements can be made on a case-by-case basis, please email with your inquiry. *All Orders Over $100 are insured. Please note: Heyday Dry Goods makes no guarantees regarding when the order will arrive once it's shipped out. Once confirmation has been made that your package has been delivered to the shipping address provided at check out, Heyday Fashion cannot be held responsible if your package was indeed mis-delivered or lost. We are not responsible for packages being sent to outdated or incorrect addresses. Please double-check to verify that the shipping address is current and correct. Should a package be returned to us due to an addresses error on your part, you will be responsible for any re-shipping charges to send it out again. Is your favorite color not shown? Or you like a item on this site and you just want us to change it a little? No problem! We encourage creativity and would love to make a unique & perfect one of a kind item just for you! We love doing custom orders. If an item you wanted is sold out, most likely we can recreate it. Please send an email and let us know what item(s) your interested in, and we will do our best to try and fill your request. A small deposit may be required before discussing custom designs. Wholesale rates are only available upon request. If you would like to have Heyday Dry Goods pieces in your shop, email us with your name/title, a description of your store, it's location, and the items you are interested in. All wholesale requirements must be met in order to receive a price list. All items should be spot cleaned or dry-cleaned. When you place an order or make a purchase with Heyday Dry Goods, we use your personal information to process your order and send you emails to confirm your order or give you updates about our site. All personal information is held strictly confidential, and will never be used by anyone else or sold to a third party. Prices and polices are subject to change without notice. By placing an order with Heyday Dry Goods you are agreeing with all terms above.